Since the Texas Film Commission began to support the rapid growth of the state’s film industry in 1971, there has been exponential growth in Texas. Not only in the number of animation classes available to learn. But the ability to work with top technology companies willing to pay top salaries to the right person. When you think of movies such as The Ant Bully and Spy Kids, you’re in the heart of Texas’ film and animation industry. Austin, Texas is also the home of the South By Southwest Film Festival. When you explore the many opportunities available to jump start your career in animation. You’ll find a long list of diverse schools targeted for your dream career in animation. 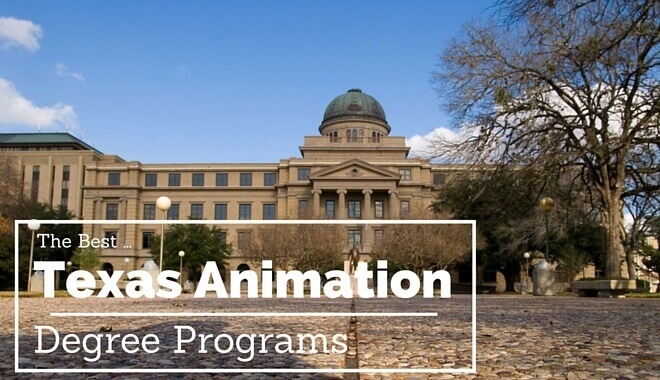 Take the time to explore the schools in this comprehensive list that highlights the best animation school choices in Texas. There are a wide variety of campuses to explore and programs that will give you the expert knowledge you need to break into this rapidly expanding field. Colleges developing animation and media programs know that you have many choices for your education, so they have put together incredible programs that truly explore the wide scope of skills needed to break into the industry. What are the best animation schools in Texas? About: In pursuit of your Bachelors of Fine Arts in Fine Media, your degree with a Visual Communications major is comprised of a vivid and visual educational experience rooted strongly in conceptual design. After you have finished the first part of your study track focusing on design, storyboarding and your conceptual courses, you will then choose which track to pursue. Your choices are either interactive or a high-end animation study path. The program is a comprehensive immersion into modeling, design, animation and advanced web application which will provide career ready skills in visualization, animation, multimedia and interactive design. The BFA in Fine Media is a five-year educational experience which has diverse emphasis options that allow you to design a program for exactly the career path you are seeking. About: Considered one of San Antonio’s finest animation programs, the School of Media and Design’s 3D Animation and Game Design program contains the latest and most advanced preparatory instruction for pursuing a career in TV, film or the video game industries. You will work with the most up to date hardware and software, ensuring you’ll be ready to find and retain employment in this evolving and changing industry. With a proven record of employment placement and career retention, the excellence of their professional, preparatory Bachelor of Fine Arts is a strong consideration for your education. About: Located in Baytown, Texas, the certificate program offered at Lee College provides a thorough and comprehensive education in the field of digital game technology. Choosing this program offers you a thorough look at the gaming industry and market as well as what skills are necessary to create the storyboarding, animation, programming and graphic arts required to develop new games. Taking your education a bit further, the full two year Associate of Applied Science Degree with a focus as a Game Development Specialist will lay the strong academic foundation necessary to either continue your education towards a four-year computer science degree or gain entry-level work in the field in many different categories including graphic artist, multimedia artist and more. About: Taking a look at the Associate of Applied Sciences Degree in Game Design at Richland College, you’ll find a fully immersive program designed to offer two tracks for your key focus. Whether you are seeking a core education in Art, Animation and Design or a degree in Programming, the choice is yours. Located in Dallas, the Interactive Simulation and Game Technology Department contained within the Engineering Business and Technology division of Richland College brings the latest hardware and software training designed to get your career off to a great start. About: You’ll quickly discover why the Computer Animation Program is one of Sam Houston State University’s most attended program. Robust prerequisite workshop in Art Studio and History and a mid-program portfolio review in your sophomore year (required to continue in the BFA program) ensures that you are prepared fully for all aspects of this program. Working through the program, you will experience a comprehensive training experience with 2D and 3D animated story telling. Branching off academically from a strong foundation in art history, design, drawing and fine art, you will progress through the in-depth educational world of 2D, 3D and Character Animation, 3D Animation for Interactive Gaming, Pre-Visualization and the History of Animation. Your senior year is a culmination of all you’ve achieved with an Animation Portfolio class where you create your portfolio of print, demo reel and website. About: Southern Methodist University is the cornerstone of Interactive Technology training. Located in Dallas, this groundbreaking program that was founded by early industry icons is a five and a half year program for those wishing to complete the full educational experience that ends with earning a Master’s Degree in Interactive Technology. Their process is diverse and intense and demands full dedication and a desire to enter the field working with some of the biggest names in animation. There are four tracks to consider once you’ve completed your first 63 hours for the general undergraduate degree and in your senior year you move to The Guildhall (SMU in Plano) where you work concurrently on your M.I.T. Choosing from Production, Programming, Art Creation or Level Design will decide where your concentration takes you. Your M.I.T program is a journey of teamwork and the development of your professional portfolio. About: At the University of Texas at Dallas, your journey into their digital liberal arts program focuses on the ever-changing landscape of media design. Explore the creative, analytical and theoretical approaches to this exciting field of study. You will immerse yourself in many aspects of the genre, including writing and research skills that focus on creative, critical and collaborative skills necessary to succeed in the field. Experience a highly focused lineup of core courses designed to introduce you to the practice and theory of Media Design and Communication. The Bachelor of Arts program’s four core courses are updated annually to keep pace with the developing content of Emerging Media. In the Master of Arts program you will experience three core concepts of quantitative methods of inquiry, theoretical perspective and creative approaches necessary to move ahead in the field. About: Collin College, located in McKinney Texas is the only local public college, granting students an excellent opportunity to explore all that is available in the community based college experience. Their Communication Design department provides an educational experience that meets the industry standards in the fields of graphic design, animation, digital video, web and interactive design. You will discover industry-experienced faculty and practicing professional amongst the highly trained staff. Drawing the latest practices and standards in the industry, you will be prepared for entry level work in the field or moving on to a four year degree and beyond. In addition to opportunities for industry internships that earn credit, guest speakers directly involved with the industry are regularly present to give talks on the issues important to your career development and interests. Whether you choose the 3D Animation Track, where you’ll learn the technical and creative concept skills for advertising, corporate and industrial visualization or the Game Art Track which puts you in the development seat for 2D and 3D art and animation for the gaming industry, you’ll be well prepared. About: You’ll begin your education at Vista College with a program track that prepares you for a variety of animation careers in video games, film and special effects as well as 3D animation. Located in San Antonio, this comprehensive program prepares you for lucrative career opportunities in the many fields demanding experienced and well-trained individuals such as Aerospace, Tourism, Defense, Education Information Technology and more. Learning how to create 3D animations, create characters that are life-like and develop believable environments are just some of the areas you’ll explore. Traditional art skills are also incorporated here. You will explore painting, sculpting, drawing and graphic design. This degree is a fantastic entry point on your journey into animation.